This is a Weis Wave indicator which is based on Richard D. Wyckoff theory. 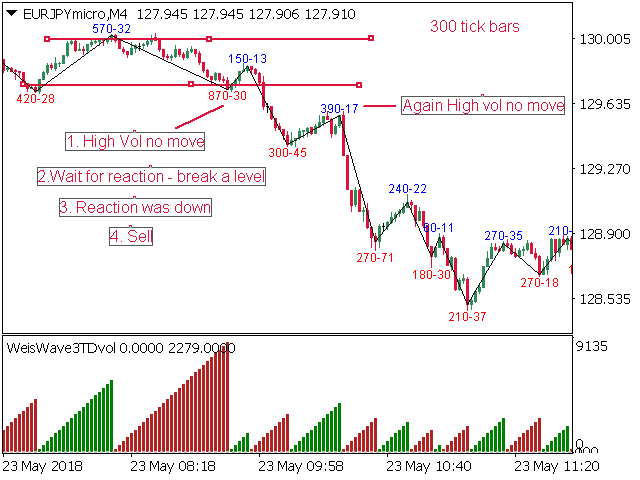 It works in all time periods, range bar and tick bar charts and it can be applied to any market. 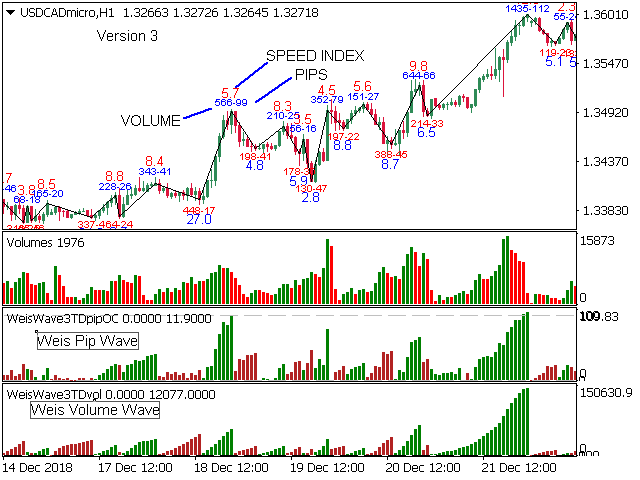 This indicator is adding the volumes of the corresponding price waves and draws a cumulative histogram. Each price wave is moving in a specific direction up or down until it reverses. In order for the indicator wave to reverse in the opposite direction, the price should exceed the number of points (pip*10) set in the indicator parameters. Therefore, the last wave repaints but the theory behind this trading method is forecasting where the market will go by reading mainly the previous waves. Furthermore, an Alert (popup, email, push, sound) can be setup if the cumulative volume of the current wave exceeds a certain number specified in the parameters. An Alert can also be setup if Speed Index exceeds a specific value and/or is below a specific value. 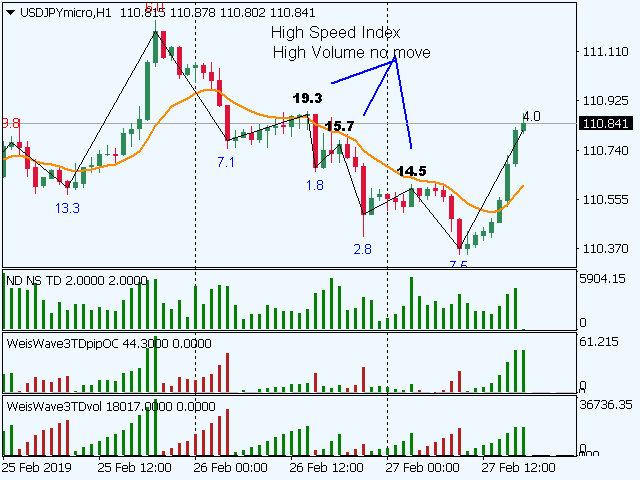 Trend trading: trade with the trend on retracement levels if the volume of the retracement wave is insignificant. Too much volume but not significant price move: Something is going to happen, wait for the price to break a significant level and follow it (High Speed Index). Other strategies can be found on the internet. Weighted Volume: true/false - Weights volume of different sessions taking into consideration that when London and US are operating at same time have the highest volume of all sessions occurs and adjusts the rest of the sessions. With this parameter it very easy visualize which volumes are significant even on Asian hours or non-significant on London-US hrs. Not to be used with constant tick charts. 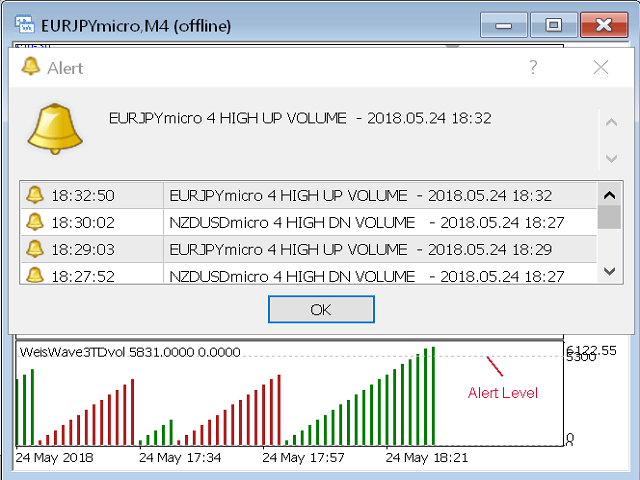 The info displayed by the alert function are: the pair, the period, a message “Hign Dn Volume” or “High Up Volume” and the time. SpeedAlert: Enable or not speed index alert - Speed Alert works on the previous wave - not the current which is forming. SpeedIndexSizeSlowAbove: Trigger Alert if speed index is above setup number. SpeedIndexSizeFastBelow: Trigger Alert if speed index is below setup number.